I feel myself compelled to share the awesomeness that is Axe Cop. It's a web comic by two brothers, the 5-year old Malachai who writes it and the 29-year old Ethan who illustrates. Honestly, it's the best thing I've seen for a long time. And the art is really quite well done, too! Here's the website with the episodes so far. Aren't too many out since it's fairly new. 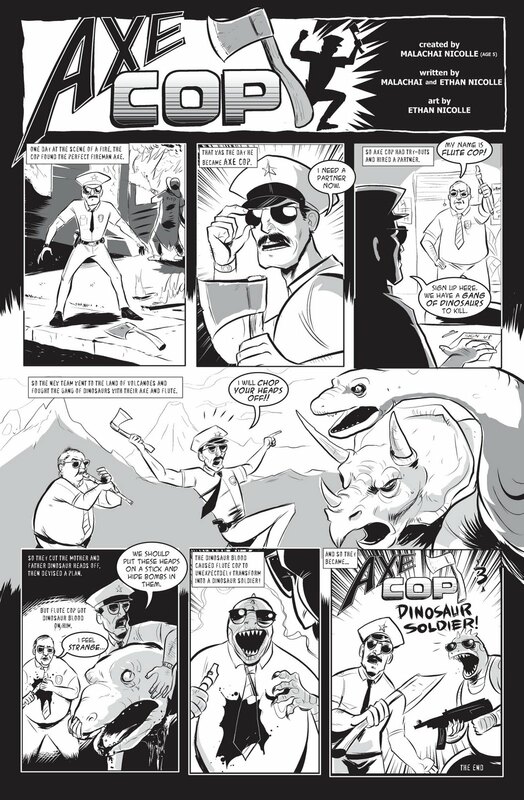 As glorious as the stories are, I'd have to say my favorite part of that site is "Ask Axe Cop." Yeah I like the naive quality, good times, reminds me of simpler times. can't remember where i saw it before,because i actually read 4 episodes already...but THANKS! i'd completely forgotten just how awesome it is. I'm looking forward to the M. Night Shyamalan big screen adaptation. Awww, something just sweet about those two brothers making a comic together. VERY interesting! !